Asteroids may be a byproduct of planet formation rather than planetary building blocks, according to a recent paper in Nature. Research done at Purdue University suggests collisions of planetary embryos - the seeds to the planets in our solar system that existed 4 billion years ago - could be the origin of the material that formed asteroids. When part of an asteroid falls onto the Earth it is called a meteorite. 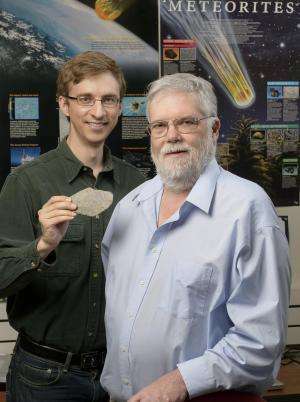 For more than a century scientists have studied the tiny bead-like grains of solidified melted rock called "chondrules" found in meteorites, but the origin of these grains remained a mystery, said Jay Melosh, a distinguished professor of earth, atmospheric and planetary sciences at Purdue who was involved in the research. "Understanding the origin of chondrules is like looking through the keyhole of a door; while we can't see all that is happening behind the door, it gives us a clear view of one part of the room and a glimpse into the very beginnings of our solar system," said Melosh, who also is a professor of physics and aerospace engineering. "We've found that an impact model fits extremely well with what we know about this unique material and the early solar system, and this suggests that, contrary to the current opinion among meteorite experts, asteroids are not leftover planet-building material and clumps of chondrules are not prerequisite to a planet." Some in the field may not warmly receive the study, said David Minton, an assistant professor of earth, atmospheric and planetary science at Purdue who also was involved in the research. "Chondrule-bearing meteorites have long been thought to be similar to the building blocks of planets," said Minton, who studies planet formation and migration and the dynamics and structure of small bodies. "This study suggests that instead chondrules might actually be byproducts of impacts between objects of an earlier generation, and meteorites may not be representative of the material that made planets." The impact model for chondrules also resolves striking similarities observed between chondrules and materials created by impacts on the Earth and the moon, Melosh said. "Chondrules are identical in size, shape and texture to spherules on Earth and spherules found in the lunar soil," Melosh said. "The only difference among chondrules, impact spherules and lunar soil particles is in their chemical composition, which fits because they are made of different starting materials from impacts on different bodies." Impact spherules are small droplets of solidified molten rock found embedded in rocks on Earth. It is widely accepted that impacts created the spherules, which formed from droplets of molten rock in the plume of debris ejected when large asteroids crashed into the Earth. The droplets condensed and solidified to form the spherules, which then fell back to the surface creating a distinct layer on the Earth, he said. Melosh is an expert in impact cratering and has studied spherules and developed methods to infer the size and velocity of the responsible asteroid from characteristics of the spherules and the spherule layer. The method of chondrule creation proposed by the team is slightly different and focuses on a small portion of debris ejected at the earliest moments of impact created by a process called "jetting." Jetting occurs at the beginning of impact as the surfaces of the two objects meet. The rock caught in the pinch between the two colliding objects is compressed to high pressure and intensely heated, which is responsible for the initial bright flash seen in laboratory impacts. The heat created by jetting is enough to melt rock and create droplets in the ejected debris that could become chondrules, Melosh said. Impact origin theories proposed in the past had been dismissed because they could not explain the melted material found in chondrules, he said. In the early solar system, collision speeds were much lower than they are now. The planetary embryos were no larger than the Earth's moon and their collisions were relatively gentle, occurring at a speed of a few kilometers per second. For the most part, impacts at this speed would blast rock into broken fragments, but not melt it, he said. "Jetting allows a low-velocity impact to melt a small quantity of the target rock," Melosh said. "The melted material, but not the broken rock, is then ejected at high speed, such that the molten droplets can escape their parent bodies and depart into space, to later loosely bunch together. Millions of years of additional impacts and other compression mechanisms then created the asteroids and meteorites we know today." The debris ejected at high speed escapes the gravitational pull of the planetary embryo, while the majority of the debris plume falls back to the surface. The dust and molten droplets quickly slow to relatively low velocities due to the nebular gas in the early solar system. The gas provides a "soft catch" for the chondrules that allows them to accumulate into smaller bodies that eventually become asteroids, he said. Chondrules have long been a puzzling feature of meteorites and, if they weren't observable in meteorites, scientists would likely never have predicted their existence, Minton said. "Chondrules are incredibly abundant and so they must be telling us something important about what conditions were like in the early solar system when the planets were forming," he said. "We think collisions were common in the early solar system and that planets are built out of the collisions between smaller bodies, so an impact theory for the origin of chondrules fits well with what we know of how planets formed." The study was led by Brandon Johnson, a graduate student under Melosh when the research began, who is now a postdoctoral researcher at the Massachusetts Institute of Technology. Maria Zuber, the E.A. Griswold Professor of Geophysics and vice president for research at the Massachusetts Institute of Technology, also is a co-author of the paper. The NASA-funded research focused on chondrules found in most stony meteorites. Chondrite is the term for meteorites that contain chondrules, and encompasses 92 percent of all meteorites, according to statistics produced by Washington University in St. Louis based on data from the Meteoritical Bulletin Database. The idea of impact jetting producing chondrules is not entirely new, and a study of the creation of chondrules from jetting of the impacts of centimeter-scale particles was published in 1975. However, this model failed to produce chondrules that would cool at the expected rate or have the correct volatile abundance, Johnson said. The idea of chondrule formation by jetting during large-scale impacts wasn't considered earlier because it was unknown if impacts could produce melt droplets that were millimeters in size and had cooling rates similar to the observed chondrules, he said. In addition, it was thought that because jetting only involves a small percentage of the mass of the impacting body it would not be able to produce the abundance of chondrules seen in meteorites. "Chondrules are some of the earliest solar system solids and clearly contain important information about conditions in the nascent solar system," Johnson said. "It is no surprise that these enigmatic particles have intrigued countless scientists over more than a century. What had been thought of as the missing pieces of an impact theory fall into place in this model." The team's model builds on an earlier study of impact jetting by Johnson, Melosh and Timothy Bowling, a graduate student in earth, atmospheric and planetary sciences at Purdue. Minton created a computer simulation based on accepted hypotheses of solar system development that follows the formation and growth of planets and estimates the location, timing, sizes and velocities of chondrule-forming impacts. He used the simulation to model the early stage of planetary formation through the accumulation of smaller bodies called planetesimals. The team also calculated the cooling rates of chondrules produced by the impacts and found that they matched the slow cooling that has been determined from analysis of the textures of chondrules in meteorites, Melosh said. A paper detailing their methods and results will be published in an upcoming issue of Nature and will be made available online Thursday (Jan. 15). The next step in the research may be to explore how this chondrule formation mechanism fits into a new model for the early stages of planet formation called "pebble accretion," in which the effect of gas drag from the protoplanetary nebula is important, Minton said. "Impact spherules are small droplets of solidified molten rock found embedded in rocks on Earth. It is widely accepted that impacts created the spherules"
Impacts are NOT the only possible method for their creation. These papers describe creating spherules in the lab using electric discharge. It simply isn't true that (most) chondrules have textures as impact spherules. Impact spherules form from material that was heated so hot that all crystallinity is lost, when such a material cools rapidly it forms a glass. Such glassy or socalled cryptocrystalline chondrules are known from a few meteorites, but the wast majority of chondrules were not heated to such high temperatures. The impact model also fails to explain the age-range and the large degree of isotopic heterogeneity that we observe, in particular in carbonaceous chondrites. "In the early solar system, collision speeds were much lower than they are now." What B.S. theory did this come from? Lets just take bad theories and use them to make our theory sound good is getting very old. Interesting, if fact. It moves planet formation back, which is in less tension with other constraints on formation. Troll activity again. Boooring, even if it gives everyone else the chuckles. I mean, how many times can you repeat the same joke? These jokers don't understand their public. @Rustybolts: The quote context was: "In the early solar system, collision speeds were much lower than they are now. The planetary embryos were no larger than the Earth's moon and their collisions were relatively gentle, occurring at a speed of a few kilometers per second." Pretty self-explanatory. But of course it would be good to have references, and I expect their paper has that. or is it just someone taking control of your mind? If planets where not created from asteroids, and asteroids are not collections of matter that coalesced then where do planets come from. My understanding was that in a super nova most heavy matter was created from hydrogen and some somewhat heavier elements. This created and scattered hot vaporous metals and bases that then coalesce into the grains as it go cool enough to form chemicals and other bonds. This tended to create clumps of more stable elements metals, oxides, and such. Then when these get large enough there is enough attraction so that these grains can combine with none chemical bonds to for much then combined with whatever was was available in the area often different types of gains, water, other gasses, and such.